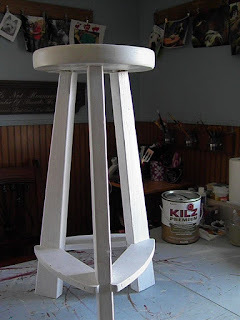 Our Bodacious Dog Mom Life: This Tall Stool Had Character. So, I Repurposed It. 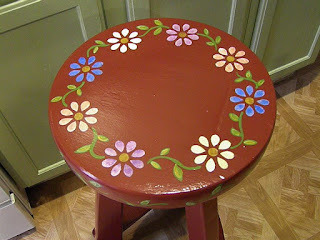 Last Fall we found this stool at one of the local flea markets. 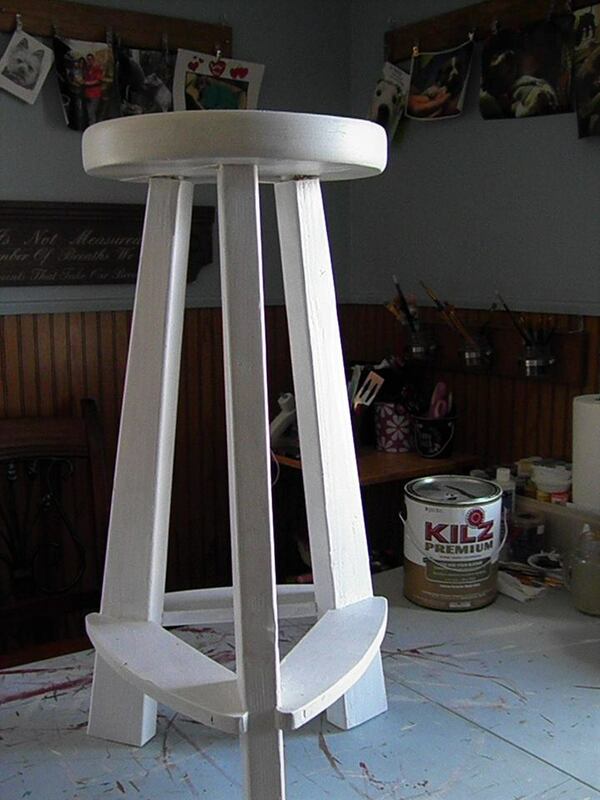 I'm not really a fan of plain ol' tall stools, but this one had character. It was the only one. Pushed aside from everything else. I remember telling Lisa, "I can do something with that." It's been sitting in the Bodacious DIY Dog Mom Project Workshop since. At the time, we were busy with Fall items and the upcoming holiday season. Then, we had a brief hiatus when the flu hit our home. Once that was over and done with, I organized the workshop, Lisa revved things up in her woodshop and we went ahead full speed. That included tackling a couple of large projects. This stool was one of them. This is the naked "before" photo. 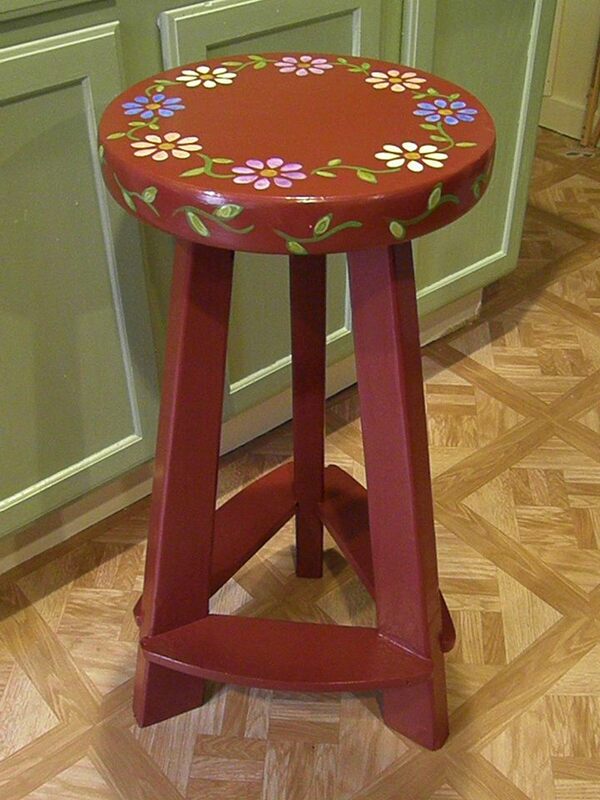 Again, taller stools don't usually catch my eye, but this one did. Lisa cleaned it up and gave it the first coat of Kilz Primer. At the end of last week, I gave it another coat of primer. Then, it was time to work my magic. I decided to go with a deep barn red paint. After 2 coats of that, I added shaded flowers to the top along with hand painted ivy on the top and side. The last thing I did was cover it with a few coats of protective varnish. I posted it as an Up For Grabs item earlier today. 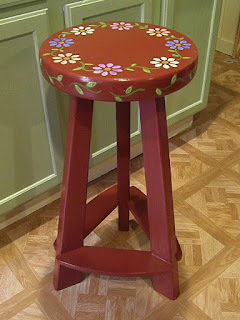 I'm completely in love with this stool. It's one of those pieces that could easily find a spot in our kitchen with a plant on top. In other words, if it does not sell, I won't be disappointed. For now, it's time to work on the other big piece that I'll be offering later this week.